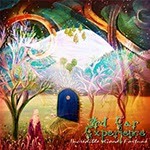 Yes, it feels so good to be exposed to a new space/psych/prog rock band as great as 3rd Ear Experience! I have somehow totally missed this amazing band from the States, even though they have released a couple of albums before this one. Recorded live in the Furst Wurld Performance and Art Gallery in the Mojave desert, this 76-minute-long space trip includes just five long, hypnotic, cosmic and psychedelic instrumental tracks of highest quality. This is the kind of music that you will want to get into a trance with.